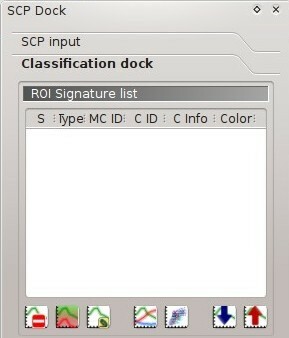 The SCP dock allows for the definition of inputs, the creation of ROIs (Regions Of Interest) and spectral signatures, and the classification of an input image. The Input image, to be classified, can be a multi-band raster or a set of single bands defined in the Band set. 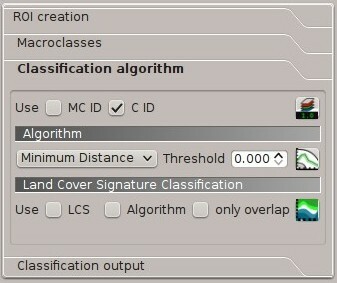 The Training input, created with SCP, stores the ROI polygons and spectral signatures used for the land cover classification of the Input image. ROIs are polygons used for the definition of the spectral characteristics of land cover classes. SCP allows for the creation of temporary ROI polygons using a region growing algorithm or drawn manually. Using the region growing algorithm the image is segmented around a pixel seed including spectrally homogeneous pixels. Temporary ROI polygons can be saved in the Training input along with the spectral signatures of the ROI. It is worth pointing out that classification is always based on spectral signatures. Training input is composed of a vector part (i.e. a shapefile) and a spectral signature part which are independent. The attribute table of the vector contains four fields as in the following table. Spectral signatures of classes are calculated from the ROIs and saved in the Training input. In addition, spectral signatures can be imported from other sources (see Import signatures). The use of the Macroclass ID or Class ID for classifications is defined with the option Use MC ID or C ID in the Classification algorithm. It is worth highlighting that when using Macroclass ID all the spectral signatures are evaluated separately and each pixel is classified with the corresponding MC ID (i.e. there is no combination of signatures before the classification). The classification can be performed for the entire image ( Classification output ) or a part of it, creating a Classification preview. This section allows for the selection of the image to be classified. Raster files must be already loaded in QGIS. Input image can be a multi-band raster or a set of single bands defined in the Band set. If a multi-band raster is selected, raster bands are listed in the Band set. The training input is a file .scp created in SCP (i.e. a zip file containing a shapefile and an xml file) used for storing ROIs and spectral signatures. Warning: Signature list files saved with previous versions of SCP are not compatible with SPC 5; however you can import a ROI shapefile using the tool Import shapefile. ROIs and spectral signatures are displayed in the ROI Signature list. ROIs and spectral signatures can be imported from other sources (see Import signatures) and exported (see Export signatures). ROIs are displayed in QGIS as vector file (in order to prevent data loss, you should not edit this layer using QGIS functions). 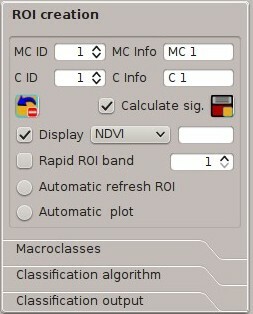 The Classification dock is designed to manage the spectral signatures, and classify the Input image. The ROI Signature list displays the ROI polygons and spectral signatures contained in the Training input. If an item is a ROI polygon, double click the item to zoom to that ROI in the map. Items in the table can be highlighted with the mouse left click. ROI creation is complementary to the Working toolbar and it allows for saving ROIs to the Training input defining classes and macroclasses. A Band set must be defined before the ROI creation, and ROI polygons must be inside the area of the Band set. Macroclasses allows for the definition of Macroclass names and colors (used to display the results of Classification preview and Classification output). 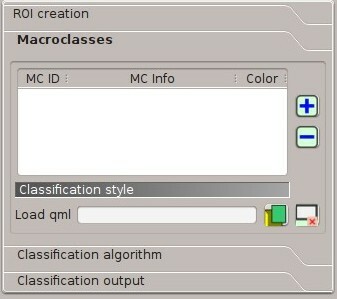 According to Classification algorithm, classifications performed using C ID have the colors defined for classes in the ROI Signature list; classifications performed using MC ID have the colors defined in the Macroclasses. The Classification algorithm includes several functions for the classification process used also during the Classification preview. 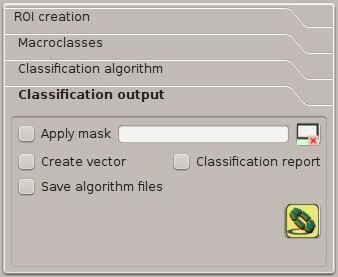 Classification is performed using the selected algorithm. Classification output allows for the classification of the Input image according to the parameters defined in Classification algorithm.